The ATF operation was intended to build cases against drug cartels, like the Zetas seen here, by tracing weapons. (CNN) -- Federal agents can't account for more than 1,400 guns after a widely criticized operation aimed at tracing the flow of weapons to Mexican drug gangs, sources with knowledge of the investigation tell CNN. Of 2,020 guns involved in the Bureau of Alcohol, Tobacco, Firearms, and Explosives probe dubbed "Operation Fast and Furious," 363 have been recovered in the United States and 227 have been recovered in Mexico. That leaves 1,430 guns unaccounted for, the sources said. The ATF operation was intended to build cases against Mexican drug cartels by allowing firearms to go from the United States into Mexico. The hope was by tracing the guns in Mexico, agents would be able to determine the structure of various cartels and then bring them down. The problem was that once the guns were allowed to "walk," there was no way to recover them until they turned up at crime scenes. The operation has been widely criticized in Congress, with the chairman of a House committee that investigated the issue calling it "felony stupid." Rene Jaquez, the ATF's former attache in Mexico City, told CNN the operation never should have happened. "Guns traditionally are just not allowed to leave the undercover operation for fear that it will enter into the criminal element and then be subsequently used in a crime at a later date," Jaquez said. "And the last thing any one of us as law enforcement officers wants to have attributed to us is the death of an innocent individual by a gun that was lost during one of our operations." But the ATF knowingly allowed individuals to purchase weapons that they knew would end up in the hands of criminals on both sides of the border. And when Border Patrol Agent Brian Terry was killed in Arizona in December, two AK-47 variants that were allowed to "walk" under the program were found at the scene. 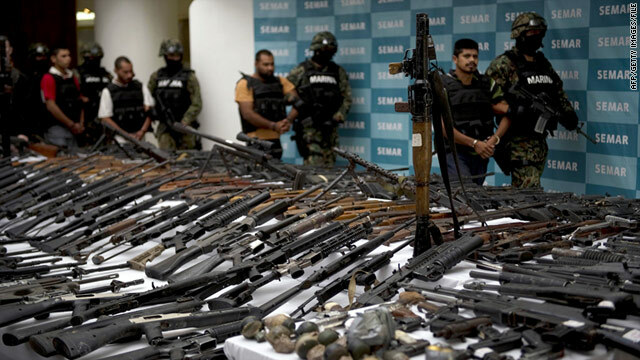 In Mexico, the operation drew sharp criticism from top officials, who have long said that U.S. weapons are fueling the country's bloody drug war. And ATF agents in Arizona told the House Oversight and Government Reform Committee in June that they cringed every time they heard of a shooting after the program had been under way for some time. Over the past several months, questions have arisen regarding who in government knew about and sanctioned this operation. Even though the operation was run out of the ATF's field office in Phoenix, Jaquez said it is highly unlikely that officials at the Department of Justice in Washington were not informed. "You have to understand, this program was in operation 18 months or more before we had any idea it existed," said Sen. Charles Grassley, R-Iowa. "And as I look back on it now, it was a, it's a big joke" -- one Grassley says isn't so funny since the guns have turned up in the hands of criminals. In late June, President Barack Obama said "appropriate action" would be taken once an investigation of the program is completed. But so far, details about who knew what and when have been scarce. Last week, the embattled acting director of the ATF, Kenneth Melson, was interviewed by congressional investigators in a closed session. While the content of the interview remains confidential, Melson's personal attorney was at his side. Grassley has stated he plans on seeing this investigation to its conclusion. "There's a basic principle of government here that the people in the Justice Department are forgetting -- the public's business should be public," he said.